What to do when “good” ingredients are bad: put up a stink! That unattractive aroma didn’t manifest itself until the shellfish, closed before they were cooked, began to steam. “I tried to [mentally] deny it, because it was somewhat of a high-pressure situation.” Those guinea pigs were fellow food writers. Selengut was equal parts mortified and steamed. 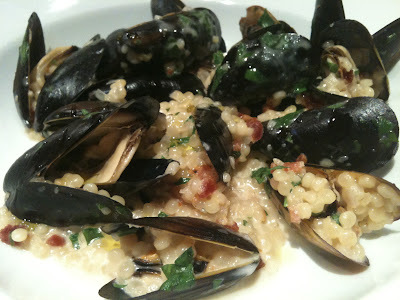 Her recipe, a mix of locally farmed mussels, Israeli couscous and bacon, should have tasted as good as it looked, but the mussels were “off” — way off. Into the garbage they went. If you could scratch-and-sniff, you wouldn’t eat these mussels. Her mortification was unjustified. She’d already served three fabulously fresh seafood dishes whose main ingredient was purchased at the same fish-counter earlier that day at Shoreline Central Market — where two of her three tasters, myself included, regularly buy excellent seafood (and where she’s since been promised a full refund). But her aggravation was understandable. I, too, have been stung by food-gone-bad at a wide swath of area supermarkets and specialty food stores, corner groceries and produce markets, as well as other shopping venues. Countless times I’ve brought home presumably fresh seafood, meat, poultry, produce, bulk goods and dairy products among other ingredients, only to find that my food may have been worth eating at some point, but that point had obviously passed. And I bet that’s also happened to you. 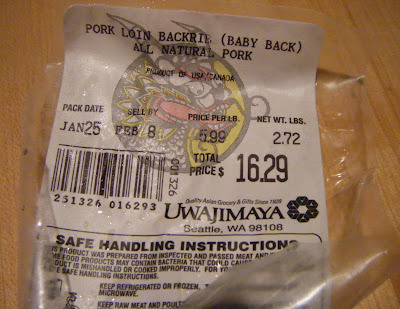 On January 29, I purchased a rack of vacuum-packed baby back ribs at Uwajimaya in Seattle. I went straight home to make dinner, opened the package and — P.U.! — was overwhelmed with a scent that nearly turned me into a vegetarian. According to the label, the ribs were packed January 25 and had a “sell-by date” of February 8. I immediately made a phone call, explaining my problem. Uwajimaya made no bones about crediting me the full amount for that sale when I came in — two months later — and I didn’t even have to show them this photo. Which I took in case I needed proof of purchase since I’d already tossed my receipt. I often shop at my neighborhood QFC, where I regularly purchase previously frozen wild-caught shrimp in the shell. And I’ll admit I was stompin’ mad a while back, when I unwrapped the just-bought seafood only to be hit with the putrid perfume of iodine. “Damn it!” I yelled, throwing the offending purchase into a Zip-Loc bag and high-tailing it back to the fish counter (a three-minute drive from my front door). Big-time apologies and a fresh batch later, I was back in my kitchen cooking dinner. Slap me, I’m a softie. 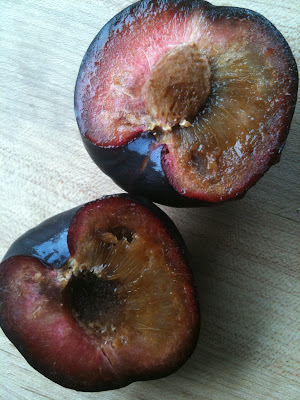 Ditto for these plums, rotten to the core. I’m all for shopping seasonally for the best food products, but believe me when I say this: I’ve bit into gorgeous fresh Washington peaches, in season, bought at fussy supermarkets and neighborhood farmers markets, only to get a mouthful of mealiness that had me cursing the big bucks I spent on the fruit. Ditto for fresh melons, apples and umpteen varieties of tomatoes. Which is to say that buying locally and/or seasonally is not a guarantee of produce perfection. Sumitra Rosella, local organics and specialty-food buyer for Rosella’s Fruit & Produce Company — and an old pal of mine from my waitressing days, when she was a chef at Saleh al Lago and I knew her as Erin — explained how I could have spent five bucks a pound on that rotten-centered plum. Purveying produce, as a company or as an individual, “we’re at the mercy of our environment,” which explains why we’re still buying asparagus from out of state. This winter has been a doozy, she said: We’ve had freezing in Arizona and Florida, earthquakes in Mexicali and in Chile. That Chilean earthquake shook plums off the trees, ships were subsequently delayed and by the time those Chilean plums arrived in Seattle, shipped off to market and my kid said “Pleaaase, Mom!” it wasn’t only my pocketbook that had taken a beating. When it comes to returning produce — or anything else one might buy from a reputable wholesaler or retailer — Rosella abides by the adage, “the customer is always right.” That old saw is what has kept her family in business for 65 years amid stiff competition, she insists. And it’s what makes and breaks businesses everywhere, especially when it comes to a perishable product like fresh foodstuffs, which, by nature, are dying products from the moment they’re caught, killed, or harvested from field, orchard or hothouse. As a former restaurateur (she was the original chef/owner of Madison Park’s Sostanza) and cheesemonger (for Whole Foods) Rosella has dealt with the problem of customer satisfaction from both sides of the counter. Yesterday, she sent out a case of local arugula to a customer who complained about a California product, and this winter she lost a customer who was frustrated by the company’s inability to get a decent “spring mix” (salad greens) when torrential rainstorms affected the supply. Buying back a customer’s trust is paramount when a problem occurs, but unlike returning a pair of shoes to a department store because the stitching is unraveling or an ill-fitting pipe to your neighborhood hardware store, returning spoiled fruit, stinky seafood or weevil-ridden grains is a far less appetizing task, and too many of us — myself included — just toss the stuff, eating the cost rather than the product. So tell me: What do you do when “good” food is bad? Have you brought food back, or complained? And if so, how have those complaints been handled at the places you shop?